Indian films are returning to Russian cinemas. As part of the Year of India in Russia, a series of major film events are including Indian film festivals. The exhibition "The History of Indian Cinema (Bollywood)" will also take place in various Russian cities. The first screenings took place at the 31st Moscow International Film Festival. An Indian week was also part of the 14th St Petersburg International Film Festival in June. Films included the drama Yarwng, shot in the indigenous Kokborok tribal language by Catholic priest Father Joseph Pulinthanath; the first film directed by Bollywood star Aamir Khan, Like Stars On Earth, which was India's official entry to The Oscars; Four Chapters from young Calcuttan director Suman Mukhopadhyay; Priyadarshan's The Wedding Sari; Indian James Bond; and Fashion from leading Indian director Madhur Bhandarkar. In addition, retrospective screenings were held of films by the famous Indian director Shyam Benegal, member of the jury at the 31st Moscow International Film Festival. The Russian passion for Indian films, born in the USSR, continues to grow in the modern day. It was in the 1950s that Soviet moviegoers first discovered "the distant India of miracles". When Indian Prime Minister Jawaharlal Nehru visited the Soviet Union in 1955, his photograph was everywhere - in shop windows, on streets and at intersections. Thousands of people lined up for tickets to be the first to see Indian films and the striking, colourful performances of Indian dancers and musicians. 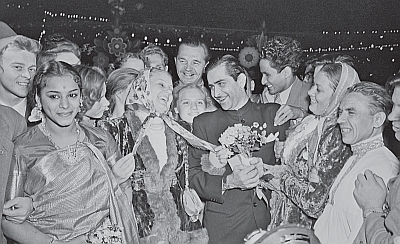 Indian actor Raj Kapoor, who came to Moscow around the same time, left the Soviet people literally besotted. According to eyewitnesses, Kapoor's shiny ZIS (the grand-style Soviet automobile meant to ferry the actor back to his hotel), which was parked outside the Udarnik movie theatre, never left the curb. The crowd simply picked the car up (with Kapoor in it) and carried it off. Then came the Indian saga about twin sisters, Seeta Aur Geeta (1972), a marvelous reminiscence of distant childhood. Children in Moscow courtyards tried to repeat the circus tricks of the brave heroine, Hema Malini. They copied her tightrope act and her daring manner of behaviour and speech. Indian cinema fans here still remember how one of the twins taught her wicked aunt a lesson. Songs from Indian movies were especially popular in the Soviet Union in the 1980s. The fashion for disco dancing forced young Russians to view Indian cinema differently after the appearance of Disco Dancer (1982). The rags-to-riches story of an ordinary young Indian boy who manages to become a famous singer once again staggered the imagination of Soviet moviegoers. Mithun Chakraborty, the film's star, replaced Raj Kapoor in the eyes of the new generation. Disco Dancer earned close to 60 mn roubles at a time when movie tickets cost 20-50 kopecks. The dance halls at Soviet summer resorts in the `80s resounded with the sounds of "I Am a Disco Dancer". Some fanatics were capable of requesting the song ten times over. After 1979, the year of the joint Soviet-Indian film The Adventures of Ali Baba and the Forty Thieves, new Indian films began to be distributed in the USSR every month - this at a time when the number of movies imported from capitalist countries did not exceed 40 per year. Who of the newest generation of Indian actors is loved in Russia today? The answer would probably be the strikingly beautiful Aishwarya Rai ("rai" in Russian means "paradise"). Even her last name sounds magical to the Russian ear, paradise being "a place of eternal bliss for the souls of the righteous". True, Miss Rai is best known to Russians, as with residents of other countries, for her work in Hollywood films. Bride and Prejudice (2004), Mistress of Spices (2005) and The Last Legion (2007) are the films featuring Rai shown most often on Russian television. Meanwhile, Russia continues to love Indian cinema classics from the 1960s and 1970s. These are the films most talked about on Internet forums, where fans lovingly collect photographs and stories of their idols. They constitute a retrospective of Indian cinema that is regularly shown on Russian television, especially the Domashny channel, which is aimed at women and promotes family values. For Russian fans of Indian films, there is even a special satellite channel called India TV. Russia's love of Indian films has now spilled over into a mass passion for Indian dance. Every self-respecting sports club in Moscow teaches yoga and the art of Indian dance. Russian girls array themselves in saris for these lessons, which are more popular even than traditional European fitness classes.